Installed 28 September 2003. Latest update 09 Oct 2017. This research has made use of NASA's Astrophysics Data System (NADS) Bibliographic Services. This page consists of a chronologically ordered bibliography of articles related to the astrometric measurements of internal motions of stellar systems. (In essense, Adriaan van Maanen resurrected.) The main area of concern has to do with, but is not limited to, spiral nebulae (currently called galaxies). Abstracts, highlights, and thumbnail sketches of a number of the articles, are being added. The compiler of this bibliography is fully aware that, at the present, about 97 percent of the articles in print since 1935 (and especially those on the world wide web) dealing with van Maanen's sixteen plus Mt. Wilson papers on internal motions of spiral nebulae (published in the 1916-1930 timeframe), paint him as being mistaken in his findings. In contrast to the majority opinion against van Mannen, it can be seen that he was not a lone voice crying in the wilderness. There may even come a need to resume astrometric studies on the internal motions in spiral nebulae. 1. Large, Diffuse Nebulosities: 0. "036 - - - - - - - - - - - - - - - - - - - - - - - - - - - - 10 objects. 2. Planetary and Annular Nebulae: 0. "028 - - - - - - - - - - - - - - - - - - - - - - - - - 17 objects. 3. Very Small Nebulae (many show evidence of spiral character ): 0. "040 - - - - 47 objects. 4. Large Spiral Nebulae: 0. "033 - - - - - - - - - - - - - - - - - - - - - - - - - - - - - - - - 66 objects. "Though the distances are discordant, they show that no considerable relative motion has occurred in the past eighty years." (c) In the mean the annual proper motions of the single knots and stars are of the order of 0".04 - 0".05, but vary within wide limits. If we are to believe that a spiral nebula, . . . , is a remote stellar system, its most luminous stars must be fainter than magnitude 21, since even in its thinner parts there is no hint of resolution into distinct stars on the best of plates; nor can the nebulous condensations, with magnitudes between 15 and 20, be considered an accumulation of stars brighter than magnitude 21. This point is important, for, if in the hypothetical galactic system the brightest stars are comparable with the bright stars of our own galaxy, the minimum distance of the Andromeda Nebula must be of the order of a million light years. van Maanen, A., "Investigations on proper motion. First paper: The motions of 85 stars in the neighborhood of Atlas and Pleione,"
Galactic Latitude +45° to +90° - - - - - - - - - - - - - - - - - - - - - 34 per square degree. Galactic Latitude –45° to –90° - - - - - - - - - - - - - - - - - - - - - 28 per square degree. Galactic Latitude +30° to +45° and –30° to –45° - - - - - - - - - 24 per square degree. Galactic Latitude –30° to +30° - - - - - - - - - - - - - - - - - - - - - - 7 per square degree. For the rotational and radial components the results are collected in Table I. The rotational components would correspond to the following periods: For Messier 101, 85,000 years; for Messier 33, 160,000 years; for Messier 51, 45,000 years; for Messier 81, 58,000 years. A comparison of a plate taken by Mr. Duncan on April 8, 1921, with one taken by Mr. Ritchey on February 7-8, 1910, both at the 25-foot focus of the 60-inch reflector, enabled the proper motion of the nebula and the relative motion of its parts to be determined. 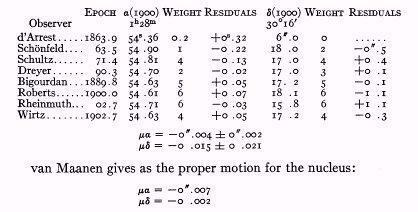 Measurements of 80 points of the nebula compared with those of 20 stars give for the nebula an annual proper motion of +0".006 in right ascension and +0".001 in declination. The internal proper motion is not a pure rotation since the mean radial component is outward and is 42 percent of the mean tangential component which is 0".019 ENWS; rather it is a spiral motion out along the arms at the rate of 0".021 per year together with a slight outward radial motion of 0".003. Two sixteenth magnitude stars with large proper motions, about 0".15 per year, were found near Messier 51. They are called f and r.
On small scale photographs the spiral appears as a bona fide nebulous object but photographed with large instruments especially the outer parts of the spiral arms seem to be resolved into numerous star-like objects. Many of these secondary nuclei look exactly like stars but a number of them have a soft appearance which has led Ritchey to call them nebulous stars. . . . Results recently published by Hubble and Shapley seem to establish the inaccuracy of estimates I made some time ago of the distances and other quantities associated with the spiral nebulae. Hubble estimates the distance of M 31 (the Andromeda nebula) as 950,000 light-years, as against my estimate of 5000 light-years. Even apart from this, however, the time has come when my calculations may reasonably be revised in the light of new nebular knowledge. . . . The method, although simple in theory, may encounter in practice a difficulty which may render it almost valueless. [Describes the potential problem. 200 sec 42° = 270 km/sec. ?? [See: Messier 33 Internal Motions on this website. Lundmark, Knut, "Studies of Anagalactic Nebulae - First Paper," Nova Acta Regiae Societatis Scientiarum Upsaliensis, Volumen Extra Ordinem Editum, (1927). van Maanen, A., "Investigations on Proper Motion - Twelfth Paper: The Proper Motions and Internal Motions of Messier 2, 13, and 56,"
van Maanen, A., "Investigations on proper motion. Fourteenth paper: The proper motion of six planetary nebulae,"
It may be remarked that the arms evidently wind out form the "mother-system" in the same direction as the rotation of the system, while the opposite is the case according to the suggestion by Poincaré. Resolution. -- The outer regions of the spiral arms are partially resolved into swarms of faint stars, while the nuclear region shows no indications of resolution under any conditions with the 100-inch reflector. Intermediate regions show isolated patches where resolution is pronounced or suggested. Distance of M31 derived from Cepheid criteria. -- Comparisons of period-luminosity diagrams indicate that M31 is about 0.1 mag. or 5 percent more distant than M33, and about 8.5 times more distant than the Small Magellanic Cloud. Using Shapley's value for the cloud, we find the distance of M 31 to be 275,000 parsecs. Relative dimensions of M31 and the galactic system. -- A tentative comparison of sizes, masses, luminosities, and densities suggests that the galactic system is much larger than M31 but that the ratio is not greater than that between M31 and other known extra-galactic systems. van Maanen, A., "Investigations on proper motion. Fifteenth paper: The proper motion of the spiral nebula N.G.C. 4051,"
van Maanen, A., "Investigations on Proper Motion - Sixteenth Paper: The Proper Motion of Messier 51, NGC 5194,"
With one exception, possibly the velocity of an isolated object seen in projection on a remote cluster, the new data fully confirm the velocity-distance3 previously formulated and extend the observational range to a distance of about thirty-two million parsecs. 3It is not at all certain that the large red-shifts observed in the spectra are to be interpreted as a Doppler effect, but for convenience they are expressed in terms of velocity and referred to as apparent velocities. Two solutions have been proposed. That of de Sitter ignores the existence of matter and supposes its density to be equal to zero. It leads to special difficulties of interpretation ... but it is of extreme interest as explaining quite naturally the observed receding velocities of extra-galactic nebulæ, as a simple consequence of the properties of the gravitational field without having to suppose that we are at a point of the universe distinguished by special properties. The other solution is that of Einstein. It pays attention to the evident fact that the density of matter is not zero, and it leads to a relation between this density and the radius of the universe. This relation forecasted the existence of masses enormously greater than any known at the time. These have since been discovered, the distances and dimensions of extra-galactic nebulæ having become known. From Einstein's formulæ and recent observational data, the radius of the universe is found to be some hundred times greater than the most distant objects which can be photographed by our telescopes. . . .
Hubble, Edwin, The Realm of the Nebulae, Yale University Press, New Haven (1936), Page 141. Messier 33 -- ...The nucleus resembles in appearance a giant globular cluster, although no evidence of resolution is found. It is semistellar, M = -8, spectral type F5, color excess-appreciable, radial velocity, -320 km/sec. *, as derived from moderately large-scale spectra. The verification of the theoretical results by observational data is discussed in some detail. H. W. Babcock's results concerning the rotation of the Andromeda nebula are in good agreement with the main theoretical result concerning the possibility of a uniform rotation of the spiral structure. ...the velocity of the system is found to be -167 ±5 km/sec... the main body of the spiral, some 18' in radius, appears to rotate [based on spectroscopic measurements and assumption of simple circular motion in the plane] almost like a solid body (rotational velocity increases fairly uniformly with distance), while the outer parts, represented by a zone having least and greatest radii of 18' and 30' respectively, appear to rotate like a planetary system (rotational velocity decreases with distance). The transition between these two types of motion occurs in the general vicinity of 16' (1000 parsecs) from the center, at which the rotational velocity attains a maximum of approximately 120 km/sec. ... In most of these [earlier] investigations [with the exception of Babcock's study of the Andromeda nebula] the rotational velocities were measured only in the immediate vicinity of the nucleus. Berendzen, R., Hart. R., "Adriaan van Maanen's Influence of the Island Universe Theory: Part 2," Journal for the History of Astronomy, 4, 73 (1973). Faber, S. M., Gallagher, J. S., " Masses and Mass-to-Light Ratios of Galaxies," Annu. Rev. Astron. Astrophys. 17, 135-187 (1979). ii) Proper Motion in the Jet - Measurements were made of the separation of knot A from the nucleus of M87 in order to see if the knots had shown detectable radial motion over the 22 year time scale. . . .
Larson, Richard B., "Formation of Small and Large Stellar Systems,"
"The announcement of Hubble's discovery was dramatic... When Hubble's paper had been read, the entire Society knew that the [great] debate had come to an end, that the island-universe concept of the distribution of matter in space had been proved, and that an era of enlightenment in cosmology had begun." . . .
Arp, Halton C., Seeing Red: Redshifts, Cosmology and Academic Science, Apeiron, Montreal (1998). Available at: Amazon.com. We present velocity measurements for 107 star clusters in the nearby, low-luminosity spiral galaxy M33...The young clusters have a maximum circular velocity of 87 ± 11 km sec-1. [Added 07 Feb 2007.] [Smith (1970) found velocities ranging from 19 to 34 km sec-1 in H II regions in M101 and M33.] . These researchers seem to be working under the assumption that the internal motions in M33 behave more or less homogeneously (similar to that expected for a semi-rigid disk) and that rotational velocity, as a function of distance from the center of the disk, can be approximated by a smooth mathematical function. According to van Maanen, the motions could more likely be represented by spiraling river-like streams with regions of stagnation between the spiral elements. Brunthaler's team studied maser regions which do not coorespond to any regions that van Maanen evaluated astrometrically. The team did measure internal motions but these were on the order of 1000 times less than those reported by van Maanen and they were in the opposite direction. Shin-Yi Lin, Nagayoshi Ohashi, Jeremy Lim, Paul T.P. Ho, Misato Fukagawa and Motohida Tamura, "Possible Molecular Spiral Arms in the Protoplanetary Disk of AB Aurigae," ApJ, 645, 1297-1304 (2006) - Abstract. Evidence that Supported Doubts that Spiral Nebulae are Separate Galaxies - Center for History of Physics - AIP.